Aroma Cup / Drinking Cup ceramics set, 12-piece, comprising of 6 aroma cups and 6 drinking cups – a Must at any tea gedustation and/or tea ceremony. Aroma Cup / Drinking Cup ceramic set, 12-piece, comprising of 6 aroma cups and 6 drinking cups – a Must at any tea degustation and/or tea ceremony. Aroma Cup/Drinking Cup Tea Set, clay pottery, 12-piece,comprising of 6 aroma cups and 6 drinking cups – a Must at any tea degustation and/or tea ceremony. Aroma Cup / Drinking Cup Tea Set, clay pottery, 12-piece, comprising of 6 aroma cups and 6 drinking cups – a Must at any tea degustation and/or tea ceremony. 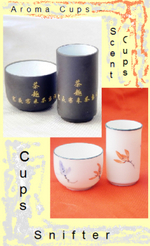 Aroma Cup / Drinking Cup, 12-piece set – a Must at any tea degustation and/or tea ceremony! Aroma Cup / Drinking Cup Set, 12-piece, ceramics, consisting of 6 aroma cups and 6 drinking cups – a Must at any tea gedustation and/or tea ceremony!